Dr. Liv Alverhuysen, a psychologist, has received a letter from a veteran’s hospital at the very edge of the tamed world, offering an opportunity for her to study mental ailments that are unknown outside the industrialised and war-torn West. She has never really thought about adventure, but ignoring her colleagues’ ridicule, she sets off to lands she barely knows anything about. Unfortunately, her peaceful research opportunity doesn’t exactly turn out as she envisioned – one of the patients at the hospital knows a secret that could shake the foundations of the New World, and the two dominant Powers of the West, the Gun and the Line have sent their forces to retrieve him. As you can imagine, hijinks ensue. 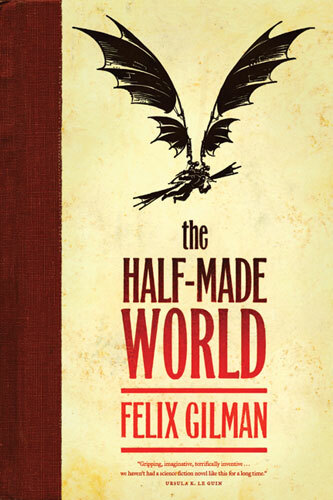 Felix Gilman takes the romance and promise of the American exploration of the West – the engines of industry, the famous outlaws, the unexplored territories, the mistreated original inhabitants of the land, and creates a whole new world where metaphor becomes reality. The Engines are immortal demons that control armies of Linesmen intent on spreading industry and homogeny wherever they go. The Guns are their arch rivals, spreading their influence through superhuman outlaw Agents of the Gun, who go by monikers like Hang-‘em-High Washburn and rob banks and blow up train tracks. Unsettled land is malleable by nature – the landscape is not fixed, thoughts can create independent entities and words have much power. Human settlement solidifies the land but does not entirely drive out the magic – the settlers instead controls it by enslaving the original population, the First Folk. The characters are also terrific. Liv starts out very wide-eyed, but slowly gains her footing and learns to take herself less seriously as the novel progresses. She’s also pretty amusing sometimes – she constantly psychoanalyses herself, but manages to completely ignore her dependence on her “nerve tonic” (laudanum). She ended up being one of the more memorable characters I’ve read about recently – she’s not especially brave or confident or even nice, but she comes through in the end. The Agent of the Gun Creedmoor was the ultimate anti-hero (I’m not actually sure he qualifies to be a hero at all). He’s not very nice either, and he’s terrified in some ways. He makes a perfect foil to both Liv and his direct antagonist Sub Invigilator (Third) Lowry of the Line (who’s an upper-level bureaucrat who tries his hardest to be self-effacing but cannot quite succeed). It was great to get points of view fron the Gun, the Line and an uninvolved party (Liv) – it made for a very compelling method of storytelling. The side characters were also pretty compelling – the loyal giant Maggfrid, the outwardly gruff businessman Mr. Bond, the lonely but sane Director of House Dolorous, and of course, the object of everyone’s search – the General. Gilman’s writing is top-notch; I especially love his sense of humour. The story never really drags, and Gilman does a great job of telling you just enough to keep you satisfied, but still intrigued. Here’s the point where I usually say I can’t wait for the sequel (The Rise of Ransom City, review coming soon), but I actually read the sequel instead of writing this review. So, yeah, it’s that good, and I can’t wait for whatever book Gilman releases next! I’ll also be checking out his back catalogue. This entry was posted in Books, Reviews and tagged book 1, fantasy, fiction, western by Kriti Godey. Bookmark the permalink.